Last night during my nightly meditations I found myself in the presence of The Horned One and once again I asked the question I always ask whenever I see Him: “What are you?”. The following images flooded my brain. I’m feeling the need to indulge my bardic side today and to relay what I saw in story form. Keep in mind this is just my own UPG. I’m not trying to convince you. This is perhaps one way it happened, in a way that was related to me by my God. If it is of use to you take it as you will or not, or better yet, ask him yourself! He came into this world much like you and I. A new soul from the primordial cauldron with infinite potential. A child of the Earth, born to his mother in ages long past. The first agonizing breath of the harsh air of this world filled his lungs, the smell of his mother the first thing in this world he knew. He knew comfort from her, the taste of her milk, the warmth of her fur. Other scents assaulted his new born nose, the rich wet Earth, the dew upon the grass, the metallic blood shed at his own genesis. 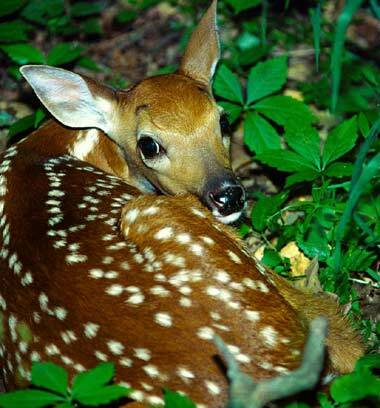 This baby fawn stood unsure on his unsteady legs, surveyed the land around him and too his first trembling steps. We will never know exactly what he was. 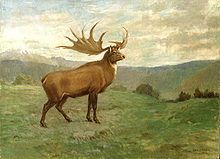 Perhaps a modern stag as we know them today, but more likely a much larger megafauna predecessor that dominated that primitive era, such as a stag-moose or an Irish elk. He lived and grew into a great specimen of his species, that faun growing into a proud buck standing tall above those around him, muscled and strong. Like any other animal he knew passion, he knew pain, hunger, and satiation. He knew the rush of blood in his head as he fought off rivals, horns locked in combat, the scent of blood again. He knew the thrill of sexual release and the smell of a female in estrus. He fathered fawns of his own. Some lived, some died, he felt no affection for them such was the way of his kind. His passions guided him, this creature of instinct. For all his strength he also knew when to run, the frenzy of the chase as he was hunted by those who saw him as prey. Like the rest of us shall one day know, he knew the release of death. The pain exploding in his side as the arrows and spears punctured his weathered flesh. The scent of blood again, present at both his birth and death filled his mighty nostrils as he breathed his last heaving breath. His flesh went to feed the tribe, his physical essence mingling with that of our early ancestors becoming part of us, his destiny tied to that of man for the very first time. By all rights it would of ended there. A life well lived, no regrets as our foolish kind know them. This single primal spirit that arose from the primordial cauldron now poised to returned to it again, bringing with it the experiences of it’s life to add to that of all those who went before him. Yet before the darkness took his spirit for the final time he heard a call that brought him back into the world of lights, the voice of a man. In later times we might call this man a shaman or sorcerer, what his own people called him is now lost to time, a mystery that only he is privy to. This man draped himself with his own former now blood stained hide, his regal skull and majestic antlers now stained and reddened with ocher and the fresh wet loam of the Earth. As his body went to feed the tribe, the man now asks him to serve the same. The confines of his former skull now serve as a fetish, a familiar domicile to house his newly arisen spirit. He answered the call of the man and served the tribe, and they in turn venerated him for his gifts. He witnessed their harsh lives and grew to know them. He learned of their needs, shared their pain and loss, exulted in their triumphs. He protected them from the dangers of the outside world that he had evaded during his natural life. He aided their hunt and lead them to food. He saw them die, and new helpless ones born into the world to replace them. The man who called him forth now had succumbed himself to the darkness that might of claimed him long ago, though the secret of his existence was whispered in hushed voices passed from the father to the son, and then to the daughter of the son, and so on forth down the line. He knew not how long he served His people, many times the span of his natural life, generations of man came into being and faded into lands embrace under his gaze. With each voice that called to him his spirit grew in awareness and knowledge. Mere beast no more, the divine spark within him grew and ignited and he became a God. This divinity was not bestowed upon him by an outside force, but it was the very spark he was born with those eons ago, the very same spark that exists within all of us, from our most enlightened spiritual teachers, to that shellfish you may have consumed without a thought last week. This spark ignited and grew into a raging fire. The landscape changed, the once plentiful herds moved on and the tribe followed them. New lands were found, the tribe split itself into many factions as some remained behind. This posed no problem to him, as spirits just like flame, are able to be in more than one place at once. As the peoples experience changed, so did their view of him. Some forgot him entirely, others renamed him. From his tempered divine spark he gave birth to new children. In the north the called him Wuldor and so he became the hunter, bow in hand silently stalking the northern wood. In Windsor they called him Herne, and he protected that forest as well taking residence in his sacred tree. In Arcadia voices raised to him shouted Pan! Pan! And thus he chased the nymphs of legend. In Gaul the venerable Cernunnos raised his antlered head and taught the children of man who sought his wisdom. Thousands of names, thousands of divine children all sprung forth from his primordial core. Some themselves going back into the cauldron of rebirth, others igniting and growing their own divine spark, all tracing their lineage back to Him and in some deep part of their being remaining part of Him. 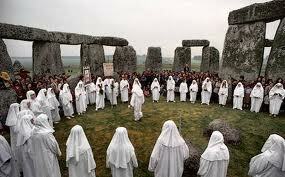 The child of the Earth watched man as he grew and changed and learned and He in turn changed and learned with them. He grew to understand and protect them, though his core remained the wild stag of ages long past. Until the day finally came that man abandoned their champion of old, and in some areas turned on him and vilified him, even sought to destroy any mention of him. He slept, needed no more as man turned to their own ingenuity and clever thought. Yet still from time to time a voice would call out in remembrance, their blood screaming out seeking to reconnect to the bond that was forged between this unnamed God and his own earliest of ancestors. Man may had forgotten him, but their blood remembers, and the blood never forgets. As more call out to him, heeding the urgency in their blood that cried out to be reconnected to the one who cared for us and shaped us, he finds himself drawn back to this world once more. A simple unassuming spirit that would of lived and died and been reabsorbed like the teeming billions of lives before him became something more, and as He did so can you. This is perhaps the most important lesson he teaches. Addendum: Ever wonder why those animal spirit familiars are so keen to help us? Everyone gets something from the interaction. As they help us, we help them.